The secret ingredient sure didn’t disappoint. I have never made such savory soup before. The taste of the pork ribs complimented the sweetness of these dried honey dates and the end result was a very light, pleasing, and refreshing soup that I just couldn’t stop sipping. It’s time to take a break from fancy meals; it feels (and tastes) really good to be back to the basics. Cut the pork ribs into short lengths and set aside. 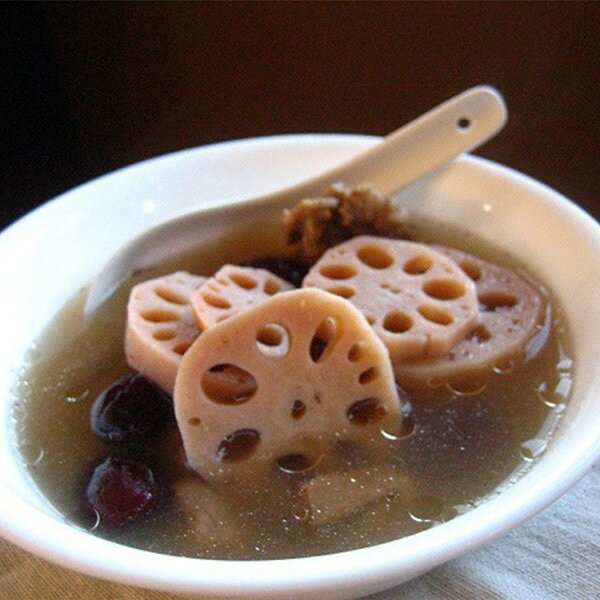 Peel off the skin of lotus root and cut into slices. Soak the dried honey dates and dried red dates in warm water for 5 minutes. Bring the pot of water to boil and add in all the ingredients. Cover the pot and simmer for 1 hour or until well cooked. Add salt to taste. i am lucky. my mum made this soup once in a while and i love it. i specially love the lotus root but i don’t take the pork rib! hey, my mum also add another ingredient… what is it call… those small red bean-like pieces which is said to be good for eyesight – don’t think it is the dried red dates. btw, i am sucker for soup… but the thing is most of the time i take the soup only and do not take the ingredients. Hi, that one is called the goji berry. In chinese we call it 枸杞. Very good for eyesight improvement. Mmmm… Good choice of ingredients. I can practically taste the soup. this soup always makes me homesick. I love it with dried oysters and dried cuttlefish too! Looks like everyone ate a lot. I need my soup too. Mmm…Yummy. My moms latest craze is throwing some dried longans into soups. That’s on my shopping list for my CNY trip back home. Lucia : Ang-Cho, I think that’s what the red bean pieces are called. Is ang-cho same as kei-chi (wolfberries)? Ahhhhh….I always knew abt the red dates..but nvr in my life thought of Honey dates! Now, I must try! Thanks again! My mom loves putting honey dates in soups. Works will with the longan, snow flower, red dates and rasins tong sui too! Mott : Ang cho are red dates and kei chee is wolfberries. BY : You got the secret ingredient absolutely correct … they are very sweet indeed and are also used in “Thong Sui”. Can’t put too much in the savoury soup or it will taste slightly off. Lotus roots. As kids, we would call them “bay gor lon”. In cantonese, it directly translates into nostrils. A soup that reminds me of my childhood. Lucia – you are just like me…I just eat the lotus root; I don’t eat the pork ribs (just use them for flavoring). The red thingy is called Kee Chee (wolf berries / goji berries). Melting Wok – your water-cress soup looks delish! Kristel – Yes yes, dried oysters or dried cuttlefish goes very well with this soup (or any soup in my opinion). I don’t have any of them at home or I would have put them in. Tigerfish – what you are waiting for, go cook fast! 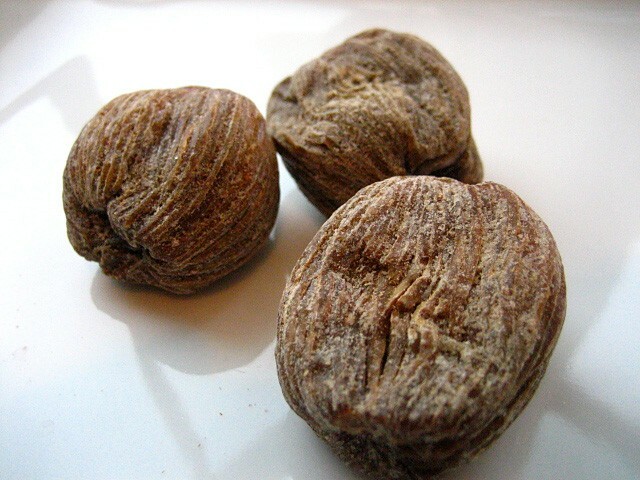 Unkaleong – Somehow I do not like dried longan in my savory soup; I like them in desserts though. BTW, those are not Ang Cho or dried red dates lah. They are called Kee Chee (in Hokkien) or Kei Chee (in Cantonese). Teckiee- will try it with desserts. Linnish – yep, I think you would love it. Audrey – I agree…just use a couple (the most) and don’t overboil the soup. Claude-Olivier – thanks for visiting Rasa Malaysia, and yes, you need to go back to Malaysia, it’s Visit Malaysia Year 2007! I agree with just eating the lotus root. It absorbs all of the flavors and is so tender that it is the best part of the soup! Bee, I just got of the phone with mom. She went, “Why you wanna boil soup ah? Ask so many questions…” Heheheh. Apologies on getting my ingredients mixed up! I married into a Hong kong cantonese family and their version of Lotus root soup is to add a couple of dried cuttlefish. Try it. Gives it a deeper taste! 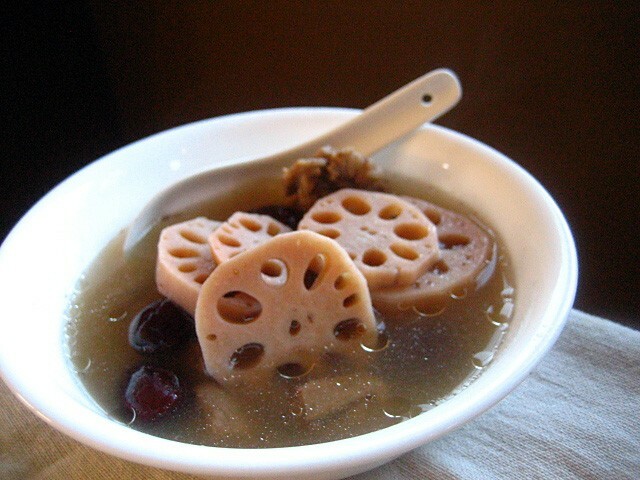 I don´t eat the lotus root, but love the soup. Actually I only drink the soup and eat the pork ribs. That´s about it. I´m SO happy! Went to the asian store today and found the “honey dates”! I wasn´t looking for it, but suddenly I saw smth that looked vaguely similar to the pix I saw here and thought…BOY! ITs the same! Saw the chinese words and was so happy that I finally found the “secret ingredient”! Can´t wait to try it together with the secret ingredient! How many grams is one lotus root normally? I bought the frozen type, that is all cut up…so have no idea how many lotus root that is. can peanut be added into the soup?? i think i saw some with peanuts too. Daniel – soups are probably toughest to photograph. That’s why I haven’t posted much. Keep reading as I try to make and photograph better soups :) Thanks for the support! i have never tryed asian food before but i would love to. you should try Kurdish food its really nice. My mum taught me how to make this soup. We add dried cuttlefish and some dried salted turnip to it minus the honey dates. I make it in the slow cooker 3 – 4 hours. Beautiful smell and taste so good! this is one of my favorite soups! i usually drink a few bowls of it every time. it’s so light and simple. i also like having it with rice. yum! Wuaw, i didn’t know that this soup has a really basic & simple ingredients. I love this soup so much!!! But not sure what is the ingredients. Reminds me of healing & healthy!!! Definetely will try soon! And btw I love ur website so much , u always give me an inspirations about cooking, as im pretty lame about it =p I just joined your facebook page, didn’t notice u have one=p Keep up the good work!!! Thanks heaps for the recipe! What is dried honey dates in chinese? My MIL always makes this when we go back to KL to visit her. After 17+ hrs of traveling on a plane it is comfort food for me. Thanks for sharing this recipe! I created this on Monday and my hubby loved it! Both my 3 yr old and 1 yr old loved it as well and they are picky eaters! I did a recipe review on this and posted it for today. I look forward to trying more of your recipes. Your site is very helpful for someone who doesn’t really know any Chinese-Malaysian recipes but wants to learn to satisfy a husband’s craving for his own native land’s food.